<!- Guardian Select: Technology & Media Tag Begins - Leaderboard ATF -> <!- Guardian Select: Technology & Media Tag Ends - Leaderboard ATF -> Zara Stone » Blog Archive » Should the Uberhood come with every Boris Bike? Should the Uberhood come with every Boris Bike? London is home to many keen cyclists and the advent of Boris Bikes (nicknamed after the mayor of London for non UK readers) in the capital has seen more and more people take up this sport. It’s a cheap convenient way to traverse central London, but the enjoyment levels of this activity do suffer with the vagaries of the British weather. It’s lovely to take a sunlit cycle ride on a nice day, less so when it’s sleeting so hard you feel like your face is being violated by Edward Scissorhands. Could Uberhood be the answer? Uberhood is an umbrella designed for the bicycle which easily clips onto the handlebar and is meant to give you cover whilst you cycle. It comes in a a variety of colours and they say it’s suitable for both ‘blazing sun and driving rain’. 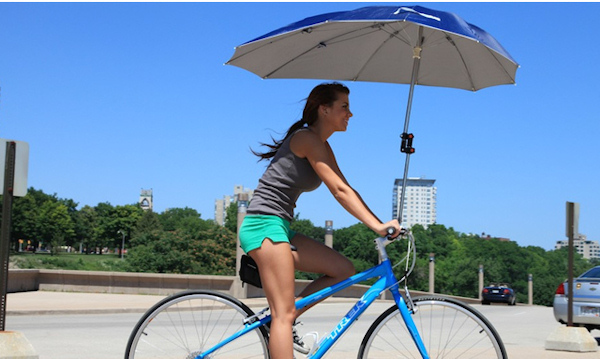 Sadly, we only get to see it pictured on someone trying it out in the blazing sun (see video and picture) so we have no way of knowing if this could withstand rain, as I feel the ‘first umbrella for the bike’ might have some serious flaws if anything stronger than a sprinkle were to fall on it. Nice concept, just not sure they really deliver on the execution. When they get it right, I’d like to see it on every Boris Bike, till then it looks like we’ll stick to buses and the tube when it’s really wet.